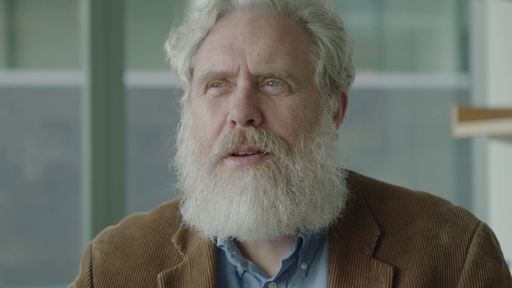 Geneticist and bio-engineer George Church interviewed in his office talking about what motivates him, the current revolution in dna editing and the implications for the future of mankind. 00:00:00 Speaker 1: I told [INAUDIBLE] you were in the player. 00:00:03 Speaker 1: Do you think you fit in that one? 00:00:11 and I like pushing the boundaries into what's sort of called disruptive or transformative technology. 00:00:19 And we have artists in the lab. And yeah, I think player would fit. 00:00:34 Speaker 2: Right, yeah, I mean, we don't take ourselves too seriously. 00:00:48 and illustrate an interesting way of looking at things. It usually makes people smile and surprised, yeah. 00:00:55 Speaker 1: And how come? Why is that, do you think? 00:00:57 Speaker 2: Why do we do that? [CROSSTALK] Why do they smile? 00:01:00 Speaker 2: Well some of them are funny, like making 70 billion copies of my book. 00:01:07 That's more than all the most well purchased books in history. And it's kind of a funny idea. 00:01:17 And the idea that the DNA could last for 700,000 years or maybe a million years is fun. 00:01:35 but also it just makes you smile to think that an old animal that's extinct comes back. 00:01:42 Speaker 1: That's one of the projects. 00:01:44 Speaker 2: Yes, right. 00:01:45 Speaker 1: That you're working with? 00:01:46 Speaker 1: And in what way is the personal genome project is part of your work? Can you explain? 00:02:03 there were all these really scary and crazy rules that didn't really make sense. 00:02:20 like WikiLeaks and so forth. 00:02:26 and we know we can re-identify. 00:02:33 we couldn't tell you because we couldn't give data back to you, just all sorts of crazy things like this. 00:02:45 what if we did just the opposite of all of those things? 00:02:48 If they sound a little crazy, let's do the opposite, maybe it will be either playful or super sane. 00:03:04 genomes, environments, and traits. It's kind of like Wikipedia for human beings. So it's revolutionary and playful. 00:03:11 Speaker 1: And can you explain what it exactly is? 00:03:14 Speaker 2: It's a collection of big data of each individual person. 00:03:21 So it's not just big because there are a lot of people, it's big for each person. 00:03:25 And it's the way we think that medicine will be practiced in the future. 00:03:38 where the people come back every year and get a update. 00:03:53 and viral sequences. The things in your environment that can greatly influence your health. 00:04:08 and interpret and understand your genome, everybody's genome that's in the project. 00:04:14 Speaker 1: And what would that mean for future if the database is getting bigger and then better? 00:04:19 Speaker 2: Yeah, so, it's not intended to be a production project so much as an inspirational one. 00:04:26 Where we show people said you can't do this, it's impossible. And we showed well, it's actually not so hard to do it. 00:04:34 And so now, it changes the conversation. 00:04:39 now people agree that maybe we should be sharing data back with the individual, getting them properly educated upfront. 00:04:50 Admitting that we can't keep the data from getting out in any project anywhere in the world. 00:04:55 In fact, even medical records in a hospital, which have nothing to do with research, are extremely valuable now. 00:05:02 They're 20 times the value of your credit card on the black market. 00:05:12 so that was the main thing we were going for. 00:05:22 and medical records available. And then you can find all kinds of correlations and what causes diseases and cures. 00:05:30 Speaker 1: And then you can almost personalize the medication and the solution, is that right? 00:05:35 Speaker 2: Yeah, not only personalized based on your DNA, but personalized based on your environment, as well. 00:05:45 And most importantly, I think, is prevention. 00:05:54 that's where you get damage to your body or you've got cancer. 00:05:59 And even if you try to catch the cancer very, very early, it's really already too late because it's already start. 00:06:05 It's got its mechanism revved up to make more mutations. 00:06:11 Speaker 1: So basically, when you explain what you are doing to somebody that doesn't know, could you explain it? 00:06:30 and write a book. We can do that with DNA, and we've brought the price down by about over a million-fold. 00:06:44 when you look further in the coming ten years, what do you foresee in the near future in ten years? 00:06:51 Speaker 1: How would it look like? 00:06:59 and faster every year. But if we can, in ten years, we'll be unrecognizable in terms of the technologies we can do. 00:07:09 We'll be able to change agriculture, medicine, forensics, you name it. 00:07:19 Even information handling that you normally think is the realm of electronics will be molecular. 00:07:24 Speaker 1: Even networking. 00:07:26 Speaker 1: And in what sense I understand crisp, what is crisp, first? 00:07:34 Speaker 1: Yeah, crisper. 00:07:47 but it represents a much broader set of tools. So we've had for a few years To engineer genomes. 00:07:56 So, in addition to the new ability to read genomes, CRISPR represents a way of editing genomes. 00:08:02 It's not the only way, but it's something that captures people's imagination. 00:08:07 And we helped invent that about three years ago now, and many people have improved on it. 00:08:25 and then re-distributed it into 30,000 laboratories. 00:08:28 Speaker 1: What is CRISPR? 00:08:49 in your DNA, and not anywhere else in your genome. So it's both positive and negative computer selection. 00:09:09 or it helps repair to whatever you want. 00:09:13 So that's precise gene editing is what people are so excited about, where you can change it into whatever you want. 00:09:26 and it can be done in a whole variety of different organisms now. Almost every organism that's been tried, it works in. 00:09:48 but I think that's like saying that ripping a page out of your journal is editing, and it's not really. 00:09:59 Speaker 1: And the possibilities that it give, is that you really can prevent a lot, when [INAUDIBLE] is that correct? 00:10:14 and you can do preventative medicine. 00:10:16 Speaker 1: It's not students, it's now really in a, this year it's really, also really growing, this technique. 00:10:25 Speaker 2: So it's a three year old technique, but it's been growing exponentially. 00:10:33 And the number of people adopting it is huge, and every new person that adopts it helps also make it work better. 00:10:50 because of course people with this diseases that are very strong, you can help those people as well. 00:11:12 even though each one only affects 1 in 100,000, together there. 00:11:22 Speaker 2: They will have 25% of their children will be severely affected, very deterministic. 00:11:29 It's not really probabilistic. It's almost guaranteed. 00:11:46 is abortion, which is not acceptable to many people in the world. 00:11:51 And so gene editing gives us the opportunity of changing the sperm, so that you don't have to affect the embryos. 00:11:58 You can do it without hurting or putting embryos at any risk. 00:12:02 So that's a new possibility that has yet to be demonstrated. 00:12:07 That will also see an incredible future when this is further on developing because you can do a lot with it. 00:12:16 Speaker 2: Yeah, you can reduce disease without eliminating the gene variants..
00:12:28 Speaker 2: Right, right. 00:12:30 Speaker 2: So we've made biocontainment versions of bacteria that are stuck in the lab. They have very low escape rates. 00:12:55 but you don't want it to get out of the wild. 00:12:57 So you have to have both the viral, anti-viral strategy and the biocontainment together. 00:13:04 That was actually done without CRISPR. 00:13:06 Quite a bit of the genome editing and genome engineering we do in our lab does not involve CRISPR. 00:13:15 and extensive engineering of 4 million base pairs without CRISPR. Yeah. 00:13:22 Speaker 1: Where comes this energy that you have in your work? Where is it coming from? What's your source? 00:13:46 you drive down the price of technology, democratizing it, making it available to many people. 00:14:04 solving the transplantation crisis, the malaria crisis, and aging crisis. 00:14:10 These are all things that are highly motivational, where millions of people are dying every year. 00:14:32 and do something were serious which is saving millions of people. 00:14:39 Speaker 2: Yeah. I remember when I was a boy in Florida living on the water, in the mud. 00:14:50 I would play in the mud and I would pull the creatures out of the mud and wonder how they worked. 00:14:57 And I would look at my father's medical bag. It was full of drugs and instruments. And I said. 00:15:12 and then I went to a World's Fair in New York cCity. 00:15:15 From, all the way from Florida to New York city when I was ten years old and and they have created a simulated future. 00:15:25 really far out on making a pretend world where they had robots that looked just like a human being. 00:15:34 And then, from that day, I could never go back to the past. 00:15:40 Even though they didn't have a real future, it was a fake future, I could not adjust any more. 00:15:45 Once I had seen the future, I had to work on it to make it happen because it seemed very attractive. 00:15:52 Speaker 1: It's exactly what my daughter also said. 00:15:55 Speaker 1: Last week, when it was in the Scientific Museum in Amsterdam. 00:16:11 where you can walk around, that you can taste it, you can feel it, you can see it. 00:16:15 They had touch pads in 1965 where you could draw something and then, it would print out the whatever you drew. 00:16:24 Not on paper, but in fabric you could actually make a scarf of a butterfly you would draw with a pen. 00:16:32 That took like forty years before there was anything even similar to that, that the average person could use. 00:16:55 what would I see? 00:17:04 obviously it can't be because you can't see the future, but it just needs to be inspiring. 00:17:07 And to a 10 year old, is particularly easy to inspire. 00:17:12 So, you might see space colonies, I think, with humans that are adapted to space. 00:17:22 it was not designed for space travel in terms of radiation resistance and the bone loss that happens at low gravity. 00:17:45 we just got better at vaccination, or something like that. 00:17:50 I mean, so, that you can, you can now go back to doing surgery without hygiene, you just doesn't even clean your hands. 00:18:08 Speaker 2: Fictional universe, kids especially will dream about it and make it happen. 00:18:25 Speaker 2: Well, I expect everything [LAUGH] so it's fun. And I wouldn't say there's anything gigantically in it. 00:18:54 I have no risk factors. So, maybe that's suprising, maybe it's false assurance. 00:19:01 Speaker 1: It's good to have you now working in the lab for the future. 00:19:06 Because somehow the lab feels like you're on the fringes of knowledge. Do I see that right? 00:19:10 Speaker 2: It certainly feels that way to me. 00:19:14 Every day somebody walks in and gives me something that shocks me and it's not easy to shock me. 00:19:23 that really changes the way we approach biological research. 00:19:31 Speaker 1: Yeah, so could you give us example when [INAUDIBLE] kind of short. 00:19:40 it's a way of you got a handheld device that it's capable of sequencing DNA. 00:19:52 so that they can spread really good genes through the environment that would make them resistant to a malaria parasite. 00:20:04 Every little breakthrough in each of those two projects is remarkable. 00:20:10 Speaker 1: Yeah, and what do you think about the criticism that you also hear of course that it's not secure. 00:20:12 And that you can create also the other side with it. What do you think of that? How do you see that? 00:20:18 Speaker 2: I'm one of the biggest critics of it. 00:20:29 because if you're not concerned things can be unintended consequences. 00:20:35 If you are concerned it helps you plan for alternatives. 00:21:07 and ideally by the governments as well. 00:21:14 but if you're dealing with synthetic DNA, that's not everyday activity. 00:21:23 you need to be under surveillance because we're in a time where you don't know how powerful it is. 00:21:32 And so, it's better to just have everything under surveillance. 00:21:36 And a particular why I proposed, was looking for people synthesizing things that are extremely hazardous. 00:21:42 Things like smallpox, and polio, and anthrax, toxin, and things like that. Cuz there's no reason. 00:21:51 They should only be ordering that if they have permission from the government to order it and a very good reason. 00:21:57 Speaker 1: Because that's all possible. 00:21:59 Speaker 2: It's very easy. 00:22:08 and the chemicals that they could use to do it themselves. 00:22:11 But if you monitor everything, then it greatly reduces the probability they could do it themselves. 00:22:19 but you can in a way you can do anything. 00:22:33 I'm not trying to reassure people. 00:22:48 are much more powerful that anything you can do with CRISPR today. 00:22:51 CRISPR and all of our amazing technology for reading and writing DNA, is now you can use for better surveillance. 00:23:03 I mean, if its a million times cheaper, you can have it distributed work of surveillance. 00:23:24 and prevention than it is for misuse. 00:23:36 not modern molecular biology. 00:23:52 Speaker 1: Millions of people use, it's like the internet in a way. Is this correct? 00:24:00 I think is we have the opportunity of having a higher security, and safety. 00:24:21 or just identity theft, and stalking, and so forth. 00:24:28 I think if you had the equivalent thing in biology, it'd be much more serious. 00:24:33 So if you have a computer virus, that might cause billions of dollars of damage. 00:24:37 But a real virus could cause billions of dollars of damage and millions of lives. 00:24:42 So I think we need to create a culture of surveillance and good deeds. 00:24:48 Speaker 1: And that's happening now? What you're saying? 00:24:52 Speaker 2: Yes it is. But we need to keep raising consciousness and keep that motivation going. Yeah. 00:25:01 Speaker 1: It is good to stay critical also. 00:25:04 Speaker 2: Yes, right. 00:25:26 via the humans. What do you think of that idea? 00:25:48 and to in fact the entire planet. 00:26:02 throw it back into the dark ages by eliminating the social fabric and cooperation. 00:26:21 we don't create global warming. If we do everything right, we could still die as a species. 00:26:27 I think the antidote to that is to get us off the planet as a sort of a space genetics planetary species. 00:26:36 And we have to start spreading outside of the planet. 00:26:41 Speaker 1: Yeah there's also one of your goals I understand, is that correct? 00:26:45 Speaker 2: Yeah, and I think we have a consortium for space genetics centered here at Harvard, but international. 00:27:02 that have to do with genetics in getting off the planet. 00:27:06 Speaker 1: Yeah, that's really the beauty of the human genome. 00:27:10 Speaker 2: The beauty of the human genome? 00:27:13 Speaker 1: Can you explain it? 00:27:15 Speaker 2: Well it's beautiful awe inspiring because it is in a certain sense very simple and very complicated. 00:27:25 There's parts of it we don't understand. There's parts of it amazingly predictive and we understand well enough. 00:27:32 It's beautiful, and it's a simple set of four letters, G, A, T, and C.
00:27:39 So, in a way, once you get a little education, you can read it just by looking at it. It didn't have to be that simple. 00:27:51 but really once you have a little bit of training it's amazing how much you can get out of human and other genomes. 00:27:58 It's a beautiful structure. It's very elegant in the two strands and the way it replicates by separating. 00:28:13 Speaker 1: Print books? 00:28:14 Speaker 2: And you can print books. 00:28:23 but you are getting into the universe of the genome. 00:28:26 Speaker 2: Right, yeah. 00:28:27 Speaker 1: Everything that comes with it. 00:28:42 Speaker 1: That far ahead? 00:28:42 Speaker 2: Right, yeah, so when I say it's simple, I'm doing it from an unusual standpoint. 00:28:47 It would be like an astronaut saying, it's simple to walk on the moon. Well maybe for you it is. 00:28:59 because we've kept it a secret. I mean, we shared it openly it's a we're very interested and open asset. 00:29:13 or to be as easy as it looks. 00:29:20 and putting together another layer of invention and another on top of that. 00:29:25 And recombining them in various ways to get hybrid inventions. 00:29:29 And it just keeps in this positive feedback loop keeps going. And it's a very funny experience..
00:29:41 It's like diving off a cliff [LAUGH] You get faster and faster as you hit the water. Yeah. 00:29:46 Speaker 1: But you're not in the water yet..
00:29:48 Speaker 2: Yeah, there may not be any water [LAUGH] It may just be free fall, yeah. 00:30:16 and there's a even smaller set that does radical, basic enabling technology. 00:30:26 but then there's a tiny set that develop technology which can be applied to almost anything. 00:30:32 So, reading and writing DNA can be applied to any organism, and can be applied even to things that are not biological. 00:30:49 Is it the tools that you use to engineer DNA can be use to engineer the tools that you used to engineer DNA. 00:30:55 It is very cyclic and the, it's just that's playful. 00:31:04 Speaker 1: Yeah, and then exponentially growing means that, well, it grows very fast. 00:31:11 Speaker 2: And what, yeah, what will it bring us in few years? 00:31:15 Well, hopefully, what it'll bring us is higher safety, rather than less safety. 00:31:27 and encourage the new generation to be focused on safety security and modeling and extensive testing. 00:31:40 But other than that I mean it will bring us whatever we want. It's unlimited. 00:31:47 The question is not so much what it will do, it's what are the few things that it won't do. 00:31:52 For example, even computers, which currently now, are not biological. Those could easily be biological in the future. 00:31:58 The most amazing computer in the world, is the human mind. 00:32:05 And if the human mind starts modifying itself, then it becomes even more amazing. 00:32:11 Than a human trying to make a computer that can't yet think the way a human can. 00:32:18 Speaker 1: So we think everything can be created. It's like a parallel universe that can be made. 00:32:29 Speaker 2: Yeah, it could be revolutionary in terms of how unrecognizable it is a few years from now. 00:32:37 Speaker 1: Yeah, so organized to inspire ten-year-old kids. 00:32:40 That it's quite difficult to put to show what it will bring us. 00:32:51 Speaker 2: Right, yeah, I mean, it's much easier to illustrate the revolutions in mechanical and electrical engineering. 00:32:57 You can build like in the days of Edison, you could build a crude prototype for a motion picture camera and projector. 00:33:08 And you can touch that, you can feel that, you can understand how it works. 00:33:14 If you were to create a futuristic [INAUDIBLE] vision today, most of the mechanisms would be invisible. 00:33:21 They'd be so small that there's no real way of observing them directly. 00:33:28 And even if you could observe them it's hard to understand what they're doing. 00:33:31 Because we're not used to thinking the way that a molecule thinks. 00:33:36 A crisper molecule in order to cut it might jump around to 6 billion different places. 00:33:43 Randomly knocking on the same wrong door until it finally finds the right place and then it will act. 00:33:50 I mean that's very different from how you would build a cuckoo clock where it does exactly what you want it to do right? 00:34:01 but I try to encourage my lab to think like a molecule. 00:34:04 Speaker 1: And how does a molecule think? 00:34:07 Speaker 2: Well, they don't. They're very random and they're fast. 00:34:22 and only get it right about once in 20 like making proteins in ribosomes. 00:34:30 Speaker 1: Random is important. 00:34:34 Speaker 2: Random, yeah, but also the randomness at the atomic molecular scale. 00:34:41 But then all of the evolved machinery of life that overcomes that randomness and makes it very non random. 00:34:50 So for example when your chromosomes separate, when your daughter cells replicate. 00:34:56 It's almost perfect, it's not random. 00:34:59 And so what you're doing is you're using the random noise of the energy of the cell. 00:35:05 To make nearly perfect decisions that should be random. 00:35:09 Speaker 1: Yeah, and then going back to the idea of the different techniques that we have now. 00:35:15 The possibilities that it gives, is you really can create all kinds of, at the start, the sperm and the egg. 00:35:31 you can change it in the sperm itself. 00:35:41 Speaker 2: Right, I mean, you can alter, well, we are already altering adult humans with gene therapy. 00:35:52 Not just in ways that correct something that's wrong, that correct an inborn, inherited mutation. 00:36:00 There are even some where we augment them as adults. For example, making them resistant to HIV. 00:36:08 I mean, it's still medicine, because they might be at risk or already have AIDS. 00:36:14 But the way you do it is not by a chemical that kills the AIDS virus. 00:36:22 It's changing the human body so it no longer has the receptor for the HIV virus particles. 00:36:39 because we are now in the phase that you are in the middle of this scientific revolution. 00:36:57 Speaker 2: It's not hard to stay motivated when you have a lot of people in the lab that are enjoying themselves. 00:37:05 And making revolutionary breakthroughs on a regular basis. Very easy to get everybody motivated..
00:37:16 Speaker 2: Right so the bleeding cutting edge of science and technology. 00:37:23 Speaker 1: Yeah so could you explain to me how your work? 00:37:28 Could you explain to me a working day in your [INAUDIBLE] cuz that's a very busy day. 00:37:31 Speaker 2: Right yeah. 00:37:33 Speaker 1: How do you work? 00:37:34 Speaker 2: It wasn't that different from regular days. 00:37:40 I usually get up around four o'clock in the morning without an alarm on my own, then I work until my wife and I walk in. 00:37:52 Together, we work on the same department in the same floor. It's just a short walk. 00:38:07 and work on without any interruptions. 00:38:11 And then my day is packed with talking some science with my students and post doctoral fellows. 00:38:20 And looking at their experiments designing and interpreting. 00:38:25 And then I usually don't take a break for lunch or anything. Then at the end of the day I walk back home with my wife. 00:38:36 And sometimes I get to visit with my daughter and granddaughter who live next door. And that's it. 00:38:50 Speaker 1: I understood that you need sleep? 00:38:54 Speaker 1: But that you dream your experiments or you dream your experience and can you elaborate on that? 00:39:02 Speaker 2: Well I'm narcoleptic, I have some kind of genetic problem that makes me fall asleep all the time. 00:39:18 I fall asleep quickly at night. And I don't wake up in the middle of the night. 00:39:24 But nevertheless, during the day I fall asleep. And what happens is I superimpose the dream state on the reality. 00:39:31 And I can't always tell the difference, and I'll talk in my sleep. But sometimes it's very helpful. 00:39:47 and makes me look at things differently But you've seen it already? I've seen alternative ways of looking at it. 00:40:07 what thinking about things the same way you've thought about them before. 00:40:11 Almost always look at them differently in dreams. 00:40:17 Speaker 2: No, no, no, it's just sometimes if I have a really difficult problem, I'll just shut down. 00:40:26 And then when I wake up, I have the answer. I don't have to write it down. I now know the answer. 00:40:34 In other cases, something strange will happen, I might write the few notes, but I'll just forget about it. 00:40:41 And then, a month later, I'll realize, yeah, that was actually something that was useful. 00:40:57 Speaker 1: Or your scientific world? 00:40:59 Speaker 2: Yeah, our scientific world, I mean, it doesn't really develop itself. 00:41:04 It needs funding, it needs educated population to support it, and to add to join as the next generation. 00:41:17 So, it's very far from self-renewing. 00:41:24 But there is a component of it where we might inspire some of the other things that we need. 00:41:29 We might inspire people to fund this and we might inspire youth to join. 00:41:44 not everybody reacts to a statement as I'm gonna look that up. 00:41:51 Most people they say, I don't believe it or I do believe and I don't care. But they don't say I wanna look it up. 00:41:58 I'm gonna research it. Prove or disprove it, yeah. But that's almost, that's the natural response that we have. 00:42:13 I still need to check it. 00:42:19 there wasn't any research are bias that sort of thing. So science is a very unusual breed in that sense. 00:42:36 and their soul. It's how they think about the world with deep curiosity, playfulness, but this rigor of inquiry. 00:42:56 Speaker 1: That it wasn't broadly picked up then. 00:43:08 were you surprised by that? 00:43:09 Speaker 2: Well, most of the technologies are not useable until a technologist makes them useable. 00:43:17 They may be derived from nature. 00:43:19 I mean in fact they may be very sophisticated machines so, for example, DNA polymerase, CRISPR. 00:43:25 These are all very, very complicated machines. It would be very hard to make from scratch. 00:43:32 From first principles on a drawing board and then manufacturing it. Once you see them you can make variations on them. 00:43:39 But making the first one without a hint would be very hard. 00:43:45 But then the technologist is needed to change that from a natural form into something that's useful. 00:43:51 And then to improve it and improve it until finally, it's usable by non-technologists. 00:43:57 And the usual reason they don't pick it up is because the technologist either hasn't really made it work. 00:44:02 I mean that sort of kind of works, works fall enough to polish but not enough for you to or someone else to use. 00:44:08 Or it works but it's not very well documented, not very user friendly. 00:44:19 it doesn't have any real way that on ordinary person could interface with it. 00:44:27 So it's not totally surprising when people don't pick up a technology. 00:44:31 What's more surprising is when you don't even have to give it a nudge. 00:44:41 and suddenly everybody gets it to work. 00:44:53 maybe five of them are that easy for people to adopt. 00:44:56 Speaker 1: Why it come that CRISPR is that easy to be adopted? 00:45:15 that you need to get that. So that takes about five years from the concept to something that people can use. 00:45:28 then things that you find in nature tend to be highly evolved. It's as if an engineer made them. 00:45:34 But whether they were evolved or however they got that way, they're got a good user interface sometimes. 00:45:41 They do what you expect them to do. 00:45:43 Speaker 1: And so why was CRISPR then, so it was also the general public picked it up? 00:45:52 Speaker 2: Yeah, the general public, I mean, we know scientists picked it up because it's easy to program. 00:45:58 The GSATs and Cs I think the general public they're a little strange. 00:46:04 It's like the name is very cute name which wasn't nobody really intentionally made it a cute name recently anyway. 00:46:14 Part of it is because there was some odd patent issues having to do with it that got some people's attention. 00:46:30 Speaker 2: A pent-up, it's kind of an overdue slot machine. Or it's a tsunami that's coming off the shore. 00:46:48 but it's really the whole collection. 00:46:57 and a lot of other things that have been building up for decades. 00:47:00 Speaker 1: And CRISPR will revolutionize, or is revolutionizing the way we can work with the DNA? 00:47:19 and some of it's rewriting DNA from scratch. 00:47:24 there is suddenly many factors of ten maybe a million times easier to use more accurate and less expensive. 00:47:34 And CRISPR gets most of the credit but there's this whole other thing sometimes called next generation sequencing. 00:47:44 these things if you didn't have all these things CRISPR would be much less interested. 00:47:50 when all these developments all coming together I still don't completely understand what it means now. 00:47:56 Speaker 1: Cuz it's such a revolution that I can't. 00:48:04 Can you share what it means that this is happening now, and what it will mean for me and my family, and my daughter? 00:48:10 Speaker 2: Well, nobody really knows what it means. 00:48:22 revolution meant, he or she would probably not guess right. 00:48:27 They probably would not guess Facebook, or maybe not even Google or search engines, or Google Maps. 00:48:37 They might have said, it will be used for calculating logarithms for rockets, so you can do warfare better. 00:48:46 Or you can do accounting better, so that you don't have to have human calculators. So I think the same thing. 00:49:12 including very smart materials like computers. 00:49:15 All these things will be altered beyond recognition in a fairly short period of time. 00:49:21 Speaker 1: We'll all live that time or is it? 00:49:26 Speaker 2: Well, I was alive in the 1950s, so yeah, we might be in the equivalent time. 00:49:37 But everything's moving faster now and one of the things that's moving faster is our ability to reverse aging. 00:49:49 because there's no law of physics that we know of that requires vision. 00:50:15 because some of the cells in the body keep on living in the next generation. 00:50:25 Speaker 2: Yes, right, we have very active projects, plural, on aging reversal. 00:50:34 Not so much on longevity, where you don't wanna prolong the end of life, which is unpleasant and expensive. 00:50:41 And where you become a less productive member of society, less engaged. 00:50:58 Speaker 1: And do you think that's possible? 00:51:01 Speaker 2: Well, it's not only possible, it's been done in animals. 00:51:08 Now those animals may or may not be good models for human. 00:51:12 But certainly the time is ripe for testing things that either cause longevity in animals or aging reversal in animals. 00:51:20 And then test to see if they can cause aging reversal in larger animals and humans. 00:51:29 there are many things that have been shown to increase animal lifespan by a factor of two to a factor of ten. 00:51:44 the telomeres, the growth factors and muscle related proteins, like myostatin pathway. 00:51:53 So there's all these pathways that are pretty well understood. 00:51:56 And if you harness a little of each for gene therapy, then you could try them separately and in combinations. 00:52:02 Gene therapy is particularly easy to go from an idea to a test of it. 00:52:08 You don't have to take a side route where you randomly screen through millions of pharmaceutical compounds. 00:52:16 And we talk about reverse aging, how does that affect the fact that you are able to, how far are we in that? 00:52:23 Speaker 1: You have gene therapy for that? 00:52:31 and reversal in some cases. Many different ways of doing that. 00:52:42 and to humans. Coming off the gene therapy trials is much easier, but we're still just beginning on that. 00:52:51 It's looking very promising, but it's too early to say. 00:52:55 And something that might even work for large animals may still not work for humans. 00:53:08 or your project where you're working where you really feel like I hope this will develop as soon as possible? 00:53:30 and aging reversal for industrialized nations, and preventative medicine in general is the strategy. 00:53:53 Speaker 2: Sure, yeah. 00:54:14 are transplantation of organs. There's a gigantic need for that. 00:54:21 Speaker 2: Gene drives to eliminate malaria, and then for developing nations. 00:54:34 and mortality is due to diseases of aging. 00:54:44 if you can solve all those, then you can reduce. 00:54:53 volcanoes and asteroids. And that has a genetic component as well. 00:54:58 Speaker 1: Okay, in what way? What's the genetic component? 00:54:58 Speaker 2: Well, we have radiation sensitivity, and our bones rot at low gravity. 00:55:11 And so even, not only in traveling, let's say, to Mars, but even once you arrive there, its gravity is 38% of Earth's. 00:55:23 And so our body was designed for normal gravity. 00:55:31 and bone wasting because the body thinks it's doing a physiological feedback loop to keep everything right. 00:55:49 you'll crush your bones and And you need muscles to move things around. 00:55:54 So, anyway, those are some of the things that are problematic. 00:56:01 And also, there's questions like what do we bring with us? Do we bring all the species of the Earth? 00:56:07 Or do we leave out the giant sequoia, and the bowhead whale, and smallpox. Do we [COUGH]. 00:56:16 Speaker 2: We could, yeah, but we haven't done that yet. We have not really recreated. 00:56:27 And so it's a big decision, is whether you take it with you. 00:56:34 that you can't really make it with our current knowledge. 00:56:53 Speaker 2: Yeah, the story? 00:56:59 Speaker 2: So a nine year old girl sent us two copies of that poster and we put it on the wall. 00:57:10 But it's based on our, she had read about our project in the news. 00:57:16 and it mainly benefits from the technology that we've developed for other projects like human medical research. 00:57:29 and writing DNA from ancient samples. 00:57:32 And [INAUDIBLE] mammoth is that the Asian elephant is the closest relative to the mammoth. 00:57:39 And it's so close in fact they're both closer to each other than they are to the African elephant. 00:57:44 And the Asian elephant can breed and make offspring children with African elephants. 00:57:48 So probably, the Asian elephant and the mammoth are basically very close to being interfertile. 00:57:55 And so, one way of focusing on modern day species is to extend the range of the Asian Elephant. 00:58:03 It will already play in the snow. 00:58:05 But you could extend it all the way out to -40 degrees in the tundra of Canada, Russia, and Alaska. 00:58:14 And furthermore, so you get a benefit to the elephant. 00:58:16 But you also get a benefit to the tundra, because the tundra is melting. 00:58:45 and so that's a warming effect and the grasses have roots that protect from erosion and then punching down the snow. 00:59:00 if you punch that down you can get penetration of the cold winter air. 00:59:11 and replace them with grass A, much richer ecosystem full of some small animals. 00:59:26 and tanks, Soviet tanks, that would knock down the trees cuz carabao can't knock down trees but elephants, [INAUDIBLE]. 00:59:32 Anyway, it was about 15 to 20 degrees, it's the difference between the experimental and the control site. 00:59:40 Speaker 1: Well, there's a variety of projects we are talking about here. 00:59:43 Speaker 2: Yes, right. Yes, yeah. 00:59:46 Speaker 1: Or working. 00:59:46 Speaker 2: Well, we haven't scratched the surface yet. 00:59:49 Speaker 2: Keep going? 00:59:51 Are there any particular things that you would like to share with the- I think we've covered a good sampling of it. 01:00:09 Speaker 1: The future. 01:00:11 Speaker 2: The future. Yeah, I think we covered it.